Pen name of Barbara Mertz, who also writes as Elizabeth Peters. Under the name Barbara Michaels, she writes primarily gothic and supernatural thrillers. 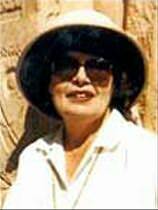 The name Barbara Michaels was chosen by her publisher since she had already published one nonfiction book on ancient Egypt, and the publisher wanted her novels to be distinctive and not be confused with her other historical book. "Phyllis Whitney is, and always will be, the Grand Master of her craft."